It’s August now. Not that that makes a huge difference here! In Malaysia, weather patterns, temperatures, smog and the prevailing spirit of the Malaysian people persist to be more or less consistent since I have arrived in this corner of the earth. Months typically don’t make much of a difference in this warm world. However, July proved to be quite unique in a myriad of ways, both surprising, and unsurprising. Ways that would make you think about home, country, those honored blessings of family and friends, and certainly God. Not that my mind is absent of these things during other times, for it is certainly not; these seven months here have proven to be the most substantively contemplative and formative of my life, but maybe because of the separation or confliction of views my mind has dwelled on those things and taken up residence in the realm of principle. And it’s been different here. I have now plodded through the meatiest part of my time abroad and it’s hard to say that I don’t think differently now. Assuredly, my thoughts have developed and I have converted to become more comfortable with them, and with where I am. For starters, I have been busy enough that my routine, though seemingly manufactured for just this year at the beginning, has taken shape as something very normal. When I come home, I feel as though I am home. When I go to work, I feel as though this is my real job. When I go out, I feel as though I am part of the community. I no longer worry about stares or awkward glances, and I don’t often get them anymore. In fact, in the small town of Maran what once seemed infinitely novel and exhilarating has become more commonplace. Largely, I believe that I have found some assimilation, that is, until I see something like a six foot 150 pound Monitor Lizard cross in front of my motorcycle as I head to school, and am invariably shaken out of it! But I am just busy in enough in school and in weekend sightseeing that it all seems normal now. After my last mid-year holiday I got bogged down in some heavy scheduling both during and after school hours. In my lessons I really decided to do a lot of more thought provoking things; things that make my students think not only in terms of the English language, but also in terms of where they are in the world, what kinds of problems we have here, and ultimately what can we do to be problem solvers in today’s world. These are hard and weighty concepts for any students to comprehend, and it took a lot of work ,but I feel like I would be doing a great disservice if I didn’t try to impart some deeper knowledge on my students while I am here—give them some critical thinking skills, some empathy. Consequently, I have focused on some weightier concepts in class as well. Teaching things like environmentalism and air pollution as well as social problems such as smoking, drugs, violent crimes, racism, sexism and general inequality. (All were in pretty light and unassuming lessons, but surprisingly the students talked about them all.) We have discussed ambitions, aspirations and dreams (in much fewer words) and about the prodigious and storied heroes that have brought us change when the world needed it most. Teaching students how to confidently speak English is much more rewarding when you can marry it with something more big picture; teaching students how to give a proper presentation while introducing them to figures like Mahatma Gandhi, Martin Luther King or Nelson Mandela is a pretty insightful lesson—one that I hope they won’t forget anytime soon. 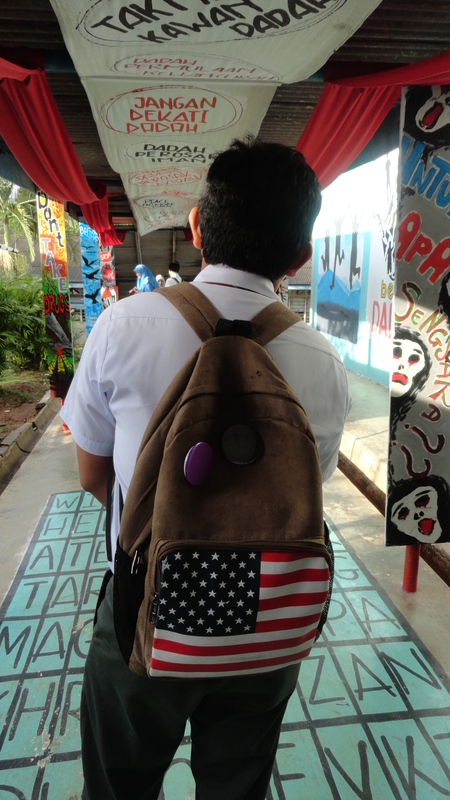 For example, on the week of 4th of July I had all of my classes learn about some of the founding fathers of the United States, and the vocabulary definitions of the words of the Declaration of Independence, all while practicing it in choral speaking. Of course I did this! And I did this because it was of course adorable, but what’s more, it is beyond rewarding to teach someone what words like equality and liberty actually mean. I have plugged in many school hours over the month and a half to make sure that I see almost every student in my school at least once a week so that they don’t miss out on such important and universal tenets—principles that certainly apply to all of them. One of my all time favorite teaching moments. 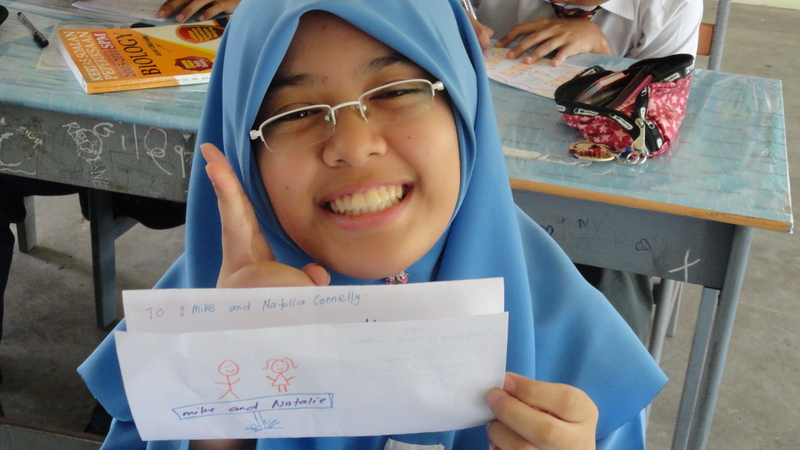 Apart from teaching my regular classes, which feels more and more regular with the passing of the days, I have also been teaching some extensive after school classes to my form six students in order to help them for their University entry English proficiency exam (MUET). My 19 and 20 year old students were extremely nervous about this greatly important test and wanted to meet as much as possible before they took it. In order to help them study and prepare them for one of the more important tests they will ever take in their life, I had extra class with them almost every day in July. We practiced reading, writing, speaking and listening,; all of which have their own section of the test given on different days. Teaching basic essay writing format was a big game changer, as was learning how to read to understand among other things and I think the classes had a great impact on how they performed, plus we had a lot of fun doing things like dissecting Woody and Buzz’s conversations in “Toy Story”. And finally, they did take their exams and for the most part they were really happy with how they did. I am excited for the results to come back as it will be a really tangible gauge of my teaching. Outside of class, and more different classes, I have been busy doing a number of things. My school had a sports day a couple weekends back. It was a hilarious display of Malay athleticism. I, of course the assumed American super athlete was told to coach all the students in running technique and how to throw the shot-put and discus. It’s a play of extremely cruel and hilarious irony that I am considered a near Olympian here just because of my skin color. I guess I’ll take it for once in my life, though I have literally never done any of those competitions competitively before. After winning a race and a the high jump all while never fainting once, (something that nearly every student did after a race, strangely) I called it a day. 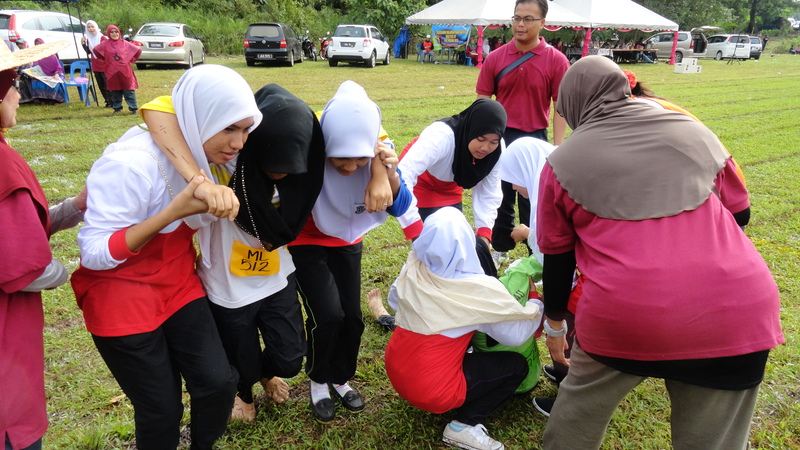 EVERY female student fainted after running their race. So dramatic. So hilarious! Other weekends have been filled with more exterior excursions and explorations. I’ve been to a couple of neighboring towns, helped slaughter my first cow ever, ate its tongue, ate horse meat, gone white water rafting, Island hopping, and partially completed one of my more favorite excursions of the year: visited Borneo. 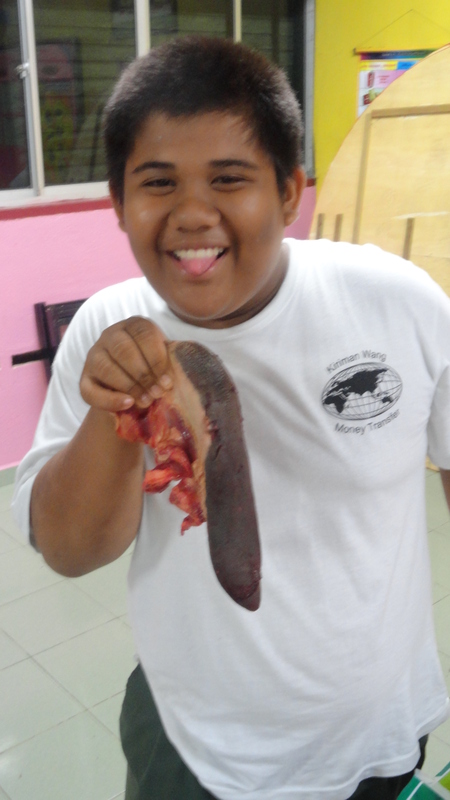 One of my students holding the cow’s tongue. We then proceeded to eat said tongue…. A midnight slaughter party with some of the male teachers at my school. The last weekend of June I attended the Rain Forest Music Festival with a large number of ETAs for a raucous good time down in the one of the oldest and least explored Jungles in the world. The venue just outside of Kuching was spectacular and the music, which was based on traditional music from indigenous equatorial tribes around the world, was equally impressive. I spent two days there and fell in love with the atmosphere. I remember being little and reading about the Wild Men of Borneo, or the Head Hunters of Borneo and always thought, “wouldn’t it be wild if I ever had the chance to go there?” I played out my dreams in this short time span and went to a place that I have always wanted to go, and played a major role in my selection of Malaysia for a Fulbright. The naturalist inside me loves Borneo. And I even had the breathtaking opportunity to see some of the most rare and most human-like creatures in the world. 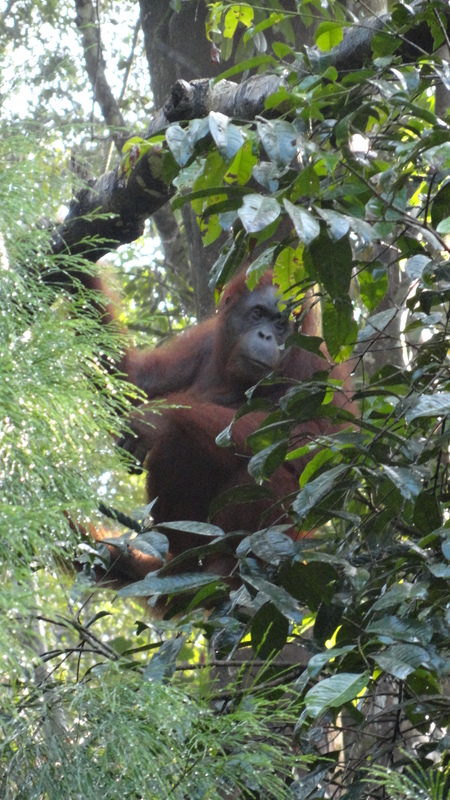 All of my life I have wanted to see a wild Orangutan, and this year, I saw one. 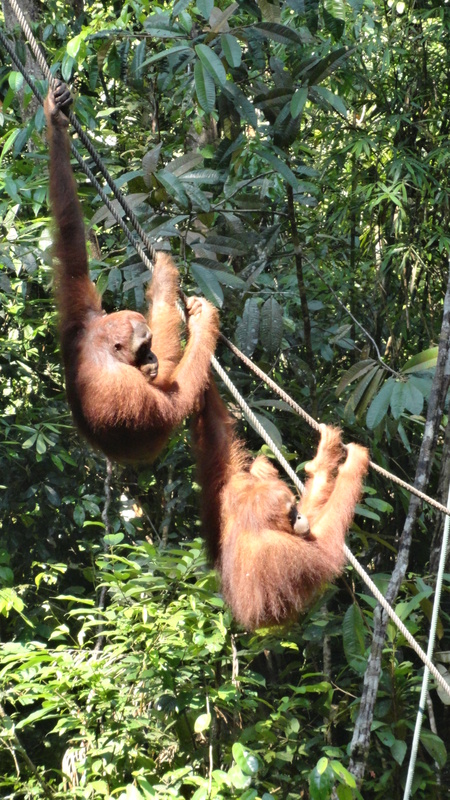 I went t to the National Park early one morning where they are said to feed rehabilitated wild Orangutans. Another friend and I made our way with a guide deep into the Jungle on a narrow path until we reached a platform in a very dense part of the forest. The guide merely set some fruit on the platform and warned us that we might not see one; some days they come, some days they don’t. But as we waited to the deafening sounds of the jungle—screaming insects and dinning birds—there we saw a tree bend in the distance. For a great while we could see nothing of the creature only the bending of trees reaching closer and closer. It was almost as if the animal could control the trees by having them convey him from one point to another. He finally emerged from the foliage and swung down a rope to the platform. He ate contentedly as at least 4 other Orangutans descended upon the fruit; a rare sight to see so many in one spot even at this location of the park. I have to say watching the silent and masterfully careful decent of the creatures to my proximity was one of the coolest natural sights I’ve ever seen. The child inside of me was shrieking, but I kept my composure in front of other human beings. Aside from weekend excursions and school, July has been a predominantly reflective month. Such reflection has been brought about by the Muslim season of Ramadan. For the past number of weeks Ramadan has been in full swing and the honored month of fasting and meditating has put me at the liberty to think and read. I have done some substantial reading since being here, most of it has been time spent on the classics of philosophy and literature, but I have really started diving into more theological and religious readings. I have been fasting and meditating with the community and despite its challenges I have found it an admirable and worthwhile dogma; one of the more rewarding aspects of my year. Don’t worry. I am not going to dive into a deluge of new beliefs or epiphanies or anything of that nature. This is far too much of a strange and public format for me to do anything like that. But I do have to say that I have a much greater appreciation for Islam, the prophet Mohammed, and the staggering devoutness of those who follow the Muslim tradition. It is certainly a worthwhile religion of study. And to be honest one that is far more similar to Christianity that it is different. The commonalities continue for days, and I have had many conversations with Muslim friends that go deep into the hours of the night about the beliefs of our related faiths. Be certain that though I view Islam, Hinduism and even Buddhism in a much stronger and respectable light, I have also grown to place pantheism, agnosticism, atheism and Universalism in a much weaker sense, and in many ways have become baffled by the contradictory logic and rationale that lead to such convictions in combative atheist works like, “God is not Great”. If nothing else from this year, though I have not been able to attend church more the a couple of times and have been distantly separated from any Christian community, I have been drawn closer to the Christian doctrines and the convictions that I have of the supernatural, the creation, the messianic embodiment, the salvation, and the judgment have been placed ever firmer on the rock of the Father’s divine logic and rationale for the universe. It has made the summer perhaps the most constructive of my convictions. And as I am far away from home, the community that I love and the body of Christ which I miss dearly, this has proven to be my biggest growing season; the summer of the soul. Missing one’s country is sobering. Missing one’s home and one’s family is saddening. Missing those blessed ceremonies of matrimony of those whom you love is tough. But the soul needs a season of growth. The soul needs time to stretch; time to bend and a time to reach its potential of peace and life. The soul needs it’s summer. Mine has simply been different—that’s all. Different than the summers of years past, but reaching the same end. That is to say, during the months between May and September in the great Midwest, extraordinary things happen. That which used to be russet and lifeless bursts into existence, erupting in bright greens, lavish hues of reds and blues—stark, purely fresh whites can be seen from wedding ceremonies to cities’ bathed in morning-glories, and the people, those hearty and dearly patient people that waited all those long months of the year for a glimpse at the sun and a warm breeze finally find their peace, and life, in summer. Posted on August 2, 2013, in Uncategorized. Bookmark the permalink. 3 Comments.